This week on BWF Radio, Facebook loses our show notes, but we still manage to kill the entire first hour without even needing them. We talk about the week in pro wrestling, including Lucha Underground, NXT, and RAW, with a little of SmackDown thrown in as well. 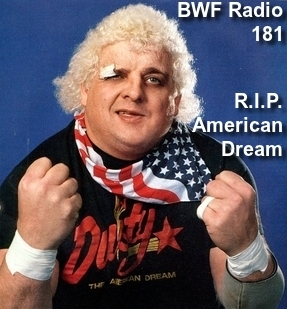 We pay tribute to the late, great Dusty Rhodes. We then skew off in a different direction talking about other television shows and video games, bringing it full circle to talk about WWE video games before the end of the first half. We kick off the second half with Money In The Bank predictions. In the news, we read some tributes to Dusty Rhodes from those who knew him. Kevin Owens defends John Cena’s in-ring abilities. Jessicka Havok may have tweeted herself out of a job. The Big O doesn’t make Tough Enough. Steve Austin is NOT facing Brock Lesnar at WrestleMania 32, but he IS using P.E.D.s – in the bedroom. WWE is trying to work with WWN since ROH is producing a Kevin Steen action figure. Chyna is trying to crowdsource money for a documentary, while she argues with Sean Waltman about drugs. What former WWE star says medical marijuana saved his life? And what kind of ghosts would Vampiro be chasing if he gets his “Ghost Hunters” style show on the El Rey Network? All this and much more, tune in! This week’s break song was “Win Hands Down” by Armored Saint. Buy it here! Like this post? Subscribe to our RSS Feed today and never miss another! The founder of BoredWrestlingFan.com and it’s parent company, Fropac Entertainment, ThinkSoJoE has been a wrestling fan since he first saw WWF television in 1986 at the age of four. His first wrestling memory was Hulk Hogan on Saturday Night’s Main Event talking about getting King Kong Bundy in a cage at WrestleMania 2. Sixteen years later, he met Hulk Hogan on the eve of WrestleMania X-8. On December 9, 2013, he legitimately won a Slammy Award (Best Crowd of the Year). ThinkSoJoE currently hosts the weekly BWF Radio podcast. Names of all wrestling promotions and their characters are the property of their respective companies. BoredWrestlingFan.com is in no way affiliated with any professional wrestling organization. © 2019 BoredWrestlingFan.com. All rights reserved.